Headlines: Two feet in three days? An El Niño-driven storm track has snow piling up in Flagstaff through Friday; ADOT Closes I-17 South of Flagstaff Due to Heavy Snowfall. Finally, measurable snow is on the pile of instruments. 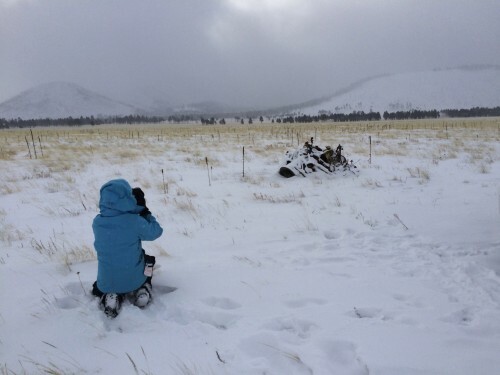 We spent the morning photographing the overnight accumulation, and recording video of the weather movements. Fantastic snow gusts raced across the landscape, continually engulfing the background trees and mountains in periods of reduced or obliterated visibility, to have them reemerge from the fog for short durations. I am hopeful that this same disappearing act will overtake the pile of instruments in the foreground; the storm warning is forecast all day tomorrow, so looking forward to more activity before the storm ends.